Jeep Roll Cage for Safety! Your Dog Doesn't Need a Roll Cage...But Your Jeep Does! Why is a roll cage necessary on some Jeep models, especially the "Universal" models which include the old Military, through the CJs, and up to the Wranglers today? Around the early to mid-1980's political pressures pushed Jeep and other auto manufacturers to focus more on safety issues. Special attention was focused on the Jeep CJs noted for their increasing rollover accidents, with sometimes catastrophic consequences to the occupants. People had been driving these Universal style Jeeps for years without much safety concern. However, these little Jeeps were becoming more and more popular with young drivers who tended to drive them like cars. The Jeep required more skill and understanding of its strengths, as well as its limitations, and did not have the same driving characteristics as cars. They had a high center of gravity and a short wheelbase which made rollovers easier to occur. So, Jeep began installing a simple rollbar on its CJs as standard equipment. The problem was that these early so-called devices were attached mostly to the Jeeps sheet-metal and were prone to tearing off of their supports in rollover accidents. Aside: A friend of mine and his wife were nearly killed when their early 70's CJ rolled over out of control after hitting some "black ice" on the road. They were not wearing seat-belts at the time (not yet mandated by government) and were thrown clear of the vehicle. When they saw their Jeep the rollbar was completely detached and lying in a ditch. Fortunately they were both okay. The Jeep, however, was totaled. In time government, safety watchdog groups, the media and eventually many consumers all began to frown on the little historic icon. Jeep was losing in the arena of public opinion. Gradually, Jeep began to add more wheelbase length and increased safety features. The Wrangler debuted in 1987 which signaled the first major upgrade to the "universal" design, which effectively improved on-pavement handling and safety in general. Roll cage technology, design and efficient mounting improved with the Wrangler through today. Factory units include "full cage" designs with padding to protect the head and other body parts in even minor accidents. The full cage is most desirable due to its full coverage of driver, and front and rear passengers. Mounting to the frame or special reinforced brackets is ideal. Aftermarket companies provide many variations of the roll cages for Jeeps and other vehicles from day-to-day commuting to all out racing configurations and alloys. As I have said before, any vehicle is capable of a rollover, and high profile, short wheel-based vehicles are at a higher risk. So, your Jeep needs a good solidly reinforced roll cage for safety. Remember: It's okay to let Rover rollover all he wants....but you need to keep your Jeep upright! Jeep Wrangler Safety...Parents and Teenagers...and New Owners! How To Save Gas Page! Jeep Soft Tops! 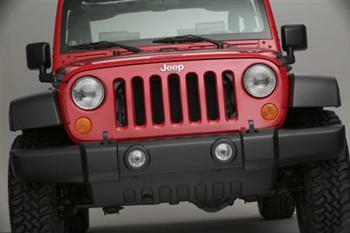 Jeep Top Depot offers a wide selection of Jeep soft and hard tops with lowest prices and fast shipping.